When it comes to home remodeling in Las Vegas, there are endless possibilities for upgrading your home. However, with the holidays approaching, there are specific areas that you can focus on to get your home ready for the festivities! Nothing could make more of a welcoming statement during the holidays than your home entry way. Whether you focus on the outside–such as remodeling a porch to give a cozy vintage appearance, or inside–such as remodeling a foyer or remodeling a staircase–the grand entrance is one that will bring warmth and welcoming to everyone gathering at your home for the holidays. New flooring installation with your kitchen remodeling makes the world of difference in bringing warmth and beauty into your home. Whether it’s tile, wood or carpet, it’s always a great feeling to walk into your home and see your new flooring! Installing new cabinets is a wonderful enhancement to the kitchen, allowing for more functionality, organization—as well as tying in to the color scheme and overall design. A kitchen island install is one of the top requested items when it comes to kitchen renovation in Las Vegas. It’s a great gathering point for family and guests to celebrate together! Installing new lighting not only makes your kitchen sparkle, but enhances the entire beauty of the room for any occasion–especially the holiday season. Choosing to include dimmer switch lights can set the mood–bringing warmth and cozy feelings into the home. Installing backsplash is the icing on Santa’s cookies as it ties in with the design of your cabinetry for a spectacular new holiday makeover! The holidays are always filled with families and guests wining-and- dining. When it comes to mealtime, you want your dining areas to look their very best. Renovating your dining room and/or breakfast nook is a great way to get everyone in the holiday spirit! When hiring a contractor for the holidays, a home bar is a great addition for bringing good cheer into your home. If you’re a wine lover, you might think about incorporating a wine cage or mini-wine cellar into your home bar area. A toasty and inviting fireplace to snuggle up to is a beautiful way to enhance your great room/family room. 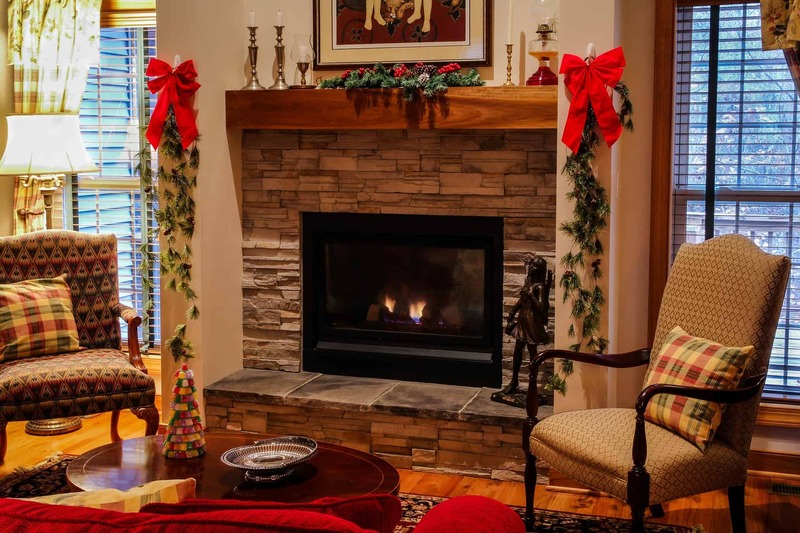 Your general contractor in Las Vegas will affirm that fireplace remodeling is on the top of Santa’s list. You may also think about installing a second fireplace in a bedroom, master bathroom, or kitchen nook area for extra warmth and comfort. During the holidays, watching movies and playing video games is often the most popular choice of home activity–especially on those chilly winter evenings. Asking your Las Vegas contractor to upgrade your media center with recessed TV, surround sound audio system, shelving, and lighting will keep your family happy and entertained throughout the holidays and thereafter. Be sure to find a construction company in Las Vegas that offers home automation, as it is a huge plus when managing not only your media, but the entire home. With family gatherings—especially families with children who often prefer sitting on the floor rather than furniture, new flooring installation in Las Vegas is a great feature to have ready for the holidays. You also have the option for heated flooring to keep toes warm and toasty on those late evenings as well as for early risers. Upgrading your lighting within your great room or family room is paramount when it comes to your home remodeling project. Your family room is likely filled with various activity and would benefit greatly with new lighting, as well as home automation to manage it. As the holidays past have proven to be quite busy with a steady flow of guests, you may want to consider a bathroom addition, either connected to a guest bedroom, or perhaps off the kitchen or family room. Bathroom remodeling in Las Vegas is always high on a homeowner’s priority list, and to have an extra bathroom or newly remodeled bathroom is always a huge plus before the holidays! There are several exciting ways to jazz up your back yard for the holidays. You might think about patio remodeling with an outdoor kitchen, fireplace or fire pit. Whether you’re cooking a full meal or simply popping outside with your coffee and roasting marshmallows, it’s a great way to bring on the storytelling, jam sessions and reminiscing under the stars! Outdoor kitchen installation is increasingly more popular as it allows everyone to enjoy gathering both indoors or outdoors. Letting more natural light inside is always a beautiful way to brighten up your home. It’s a proven fact that natural light lifts spirits, bringing an overall good feeling to all. Before the holidays, think about installing a new window in a strategic place-such a breakfast nook to allow for a picturesque setting. The holiday season brings an abundance of gatherings, savory meals and celebration for all. When you are hosting people at your home, you want to entertain your family and friends with a clean, updated home that welcomes them and gives them the comfort they deserve.